Some of what you’ll see depicted in the following charts originated a decade ago in the Global Financial Crisis – or was caused by the reactions of central bankers to that crisis. The many shocking, previously unimaginable acts by central banks and governments left us so numb that I think we started to simply accept them without much thought. That was our mistake: We must confront the unthinkable, not just shrug our shoulders at it. Because when we have our next crisis, I will bet you dollars to donuts that central banks and governments will react in ways that are even more unthinkable. Before we get our thinking caps on, let me remind you that early registration is now open for my next Strategic Investment Conference. The dates are March 6-9, 2018, at the Manchester Grand Hyatt in San Diego. We’ll have a wonderful time with an all-star cast including Jeffrey Gundlach, Mark Yusko, John Burbank, Niall Ferguson, and George Gilder. I’m in negotiations with other well-known names, too. This year we’re making a special effort to sell out the conference as early as we possibly can. I really want to focus my full attention on designing the program and working with the speakers to deliver an outstanding experience. That’s much easier when I don’t have to think about whether there are still unsold seats. To that end, we’re offering exceptionally generous discounts for early registration. If you’ve already decided to attend, you would do us both a big favor by registering now. You’ll save a few hundred dollars and avoid getting stuck on the waiting list. Click here to register or get more information. Now on to the bonfire. If you work in the financial industry you’ve probably read, or at least know plenty about, the Tom Wolfe novel Bonfire of the Vanities. It’s a great book, but it’s not the source of this letter’s headline. 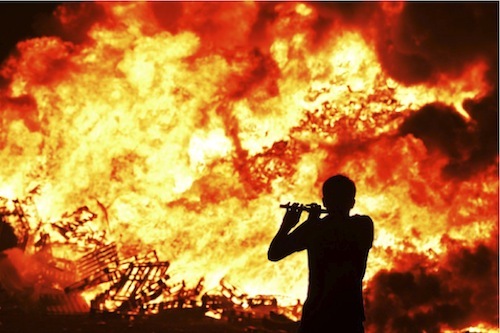 I’m thinking back further to the original “bonfire of the vanities” in fifteenth-century Florence. In 1490 the ruling Medici family brought in Dominican friar Girolamo Savonarola to serve them, but within a few years he was more or less ruling the city. In 1495, during the pre-Lenten carnival, Savonarola began hosting a “bonfire of the vanities,” at which people would burn objects that inspired the deadly sin of vanity: mirrors, cosmetics, musical instruments, and so on. This being Florence, they also destroyed tons of artworks, tapestries, books, furniture, and other priceless treasures. Did doing so make them any less vain? Probably not, but I’m sure the bonfires were quite magnificent. In a similar manner, we in this century routinely “burn” hard-won lessons (or at least expel them from our thoughts) because someone with an ulterior motive convinces us they’re useless or harmful. That’s rarely true, as we often discern too late, and then we have to learn the same lessons again. Think about this. How often do central bankers, regulators, corporate leaders, lawyers, politicians, and ordinary investors make the same mistakes over and over again? All the time. If we would stop burning our memories, we might make better progress. But no, we must have our bonfires. And so the absurdities are perpetuated. Not to put too fine a point on it, but this is bonkers. I understand that we were caught up in an unprecedented crisis back then, and I actually think QE1 was a reasonable and rational response; but QEs 2 and 3 were simply the Fed trying to manipulate the market. The Keynesian Fed economists who were dismissive of Reagan’s trickle-down theory still don’t appear to see the irony in the fact that they applied trickle-down monetary policy in the hope that by giving a boost to asset prices they would create wealth that would trickle down to the bottom 50% of the US population or to Main Street. It didn’t. The Fed has left that bloated balance sheet alone for almost 10 years. And now for some reason they feel it is urgent to reduce the balance sheet even as they also raise rates. This is not model-based monetary policy; it is simply an emotional monetary policy experiment. I can understand raising rates – I wish they had done that four years ago. I can even understand reducing the balance sheet. But at the same time? When you don’t know what you don’t know? I mean really, there is no way to know how the market is going to react to either of these events, let alone to both at the same time. This seems to me the height of monetary policy lunacy. We all lived through this remarkable set of experiments, but it’s still amazing to think that in 2007–2008 the Fed chopped short-term rates by five full percentage points in just five quarters. Today we agonize over whether they’ll hike rates by half as much, spread over five years or more. Note also that this gargantuan rate cut still couldn’t avert a near meltdown of the banking system. You can argue that it would have been even worse to do nothing, but it’s hard to argue they didn’t do all they could have. Meanwhile, the more sober-minded (hah!) gnomes of the Swiss National Bank expanded their own balance sheet at a much steadier pace, though in percentage terms they blew it up far more than the Fed or the BOJ did theirs. 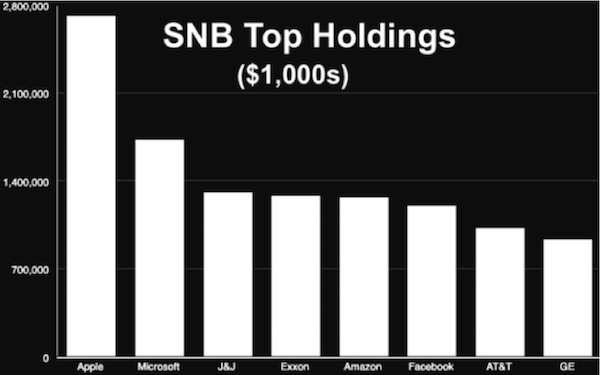 The Swiss National Bank is now the world’s largest hedge fund. We have written many times about the fact... and it is a fact... that the Swiss National Bank has effectively become both the nation’s central bank and one of the largest, if not indeed the very largest, hedge funds in the world. The process began several years ago when the SNB swore that it would do what it could and using what methods were available to it to weaken the Swiss franc relative to the EUR and to the US dollar. It has succeeded, until recently, creating Swiss francs out of the thinnest of air, and selling those Francs vs. the EUR and the dollar, and then taking those EURs and dollars to buy European and US equities and debt securities. 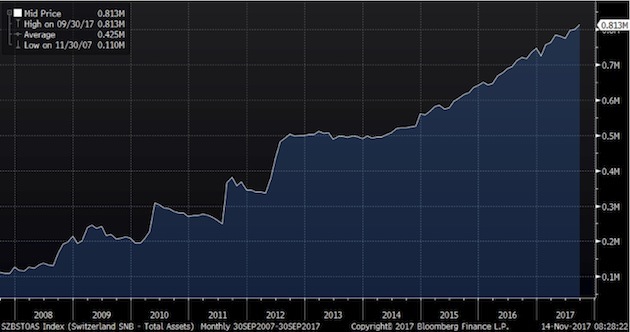 The SNB’s balance sheet is a CHf 813 billion (and given that the CHf and the US dollar are effectively at parity one with the other that CHf 813 billion is the same as $813 billion) and this is very nearly 125% of the Swiss GDP. 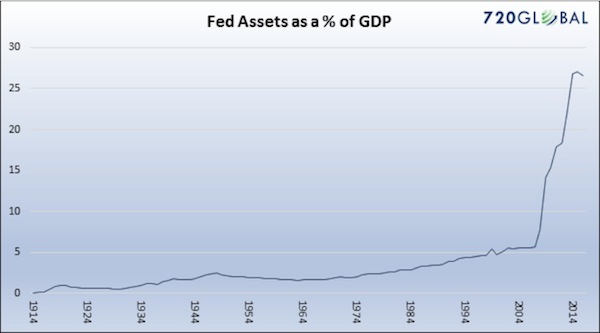 By comparison, the Fed’s balance sheet of $4.5 trillion is but 25% of the US GDP. In other words, if the Fed is taken to task for being expansionary, the SNB is truly explosive! Of the CHf 813 billion on the Bank’s balance sheet, 760 billion of it is the form of securities, of which 90 billion are in equities. The other 670 billion are held in EUR and US debt securities. 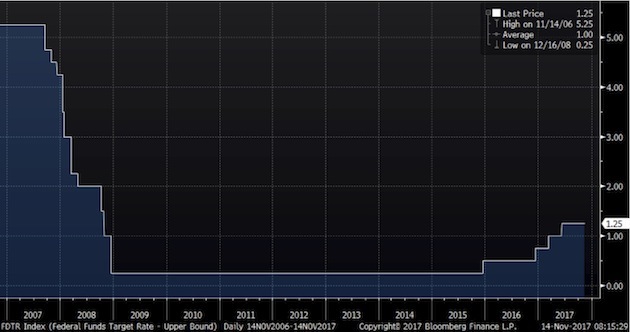 Thus far this has been a huge, stunning, almost unimaginable profit for the SNB and theoretically for the people of Switzerland. However, the problem is that the SNB will have enormous difficulty in liquidating this massive portfolio, for once the news leaks out that the Bank is selling the bids will disappear; the CHf will soar in price while debt and equity markets melt away. What the SNB has done here is stunning; some have even called it nearly “criminal” in nature. We suggest that there is nothing at all criminal in what the SNB’s leaders have done and that they are well within their legal guidelines; however, what they have done is optically and philosophically wrong and very badly so. This is QE gone very badly wrong, rivaled only by the same actions taken by the Bank of Japan that openly deals in the forex, debt and equity markets in Tokyo, buying ETFs on a very regular basis and becoming one of Japan’s largest public shareholders. 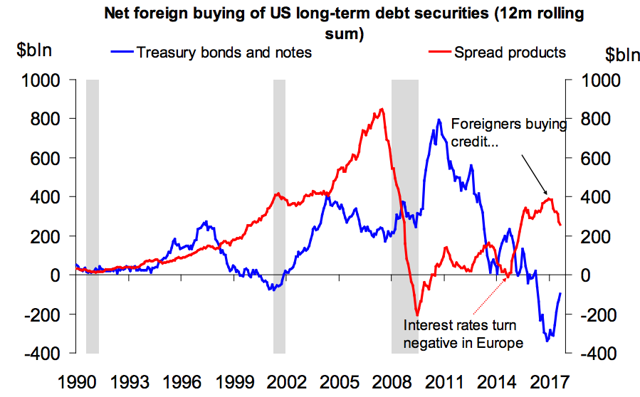 This is central banking gone very, very badly awry. It will be stopped when equity prices collapse. 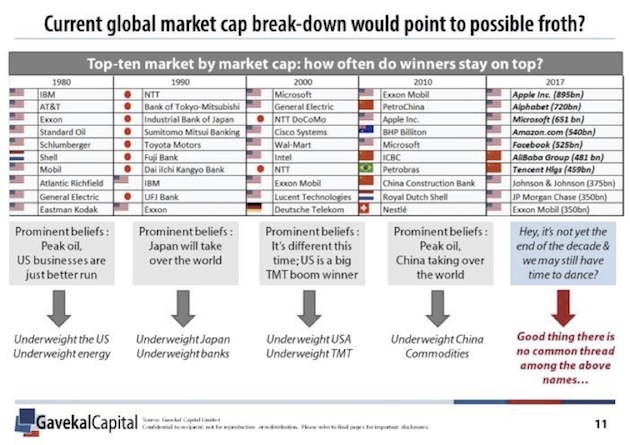 Switzerland is now the eighth-largest public holder of US stocks. 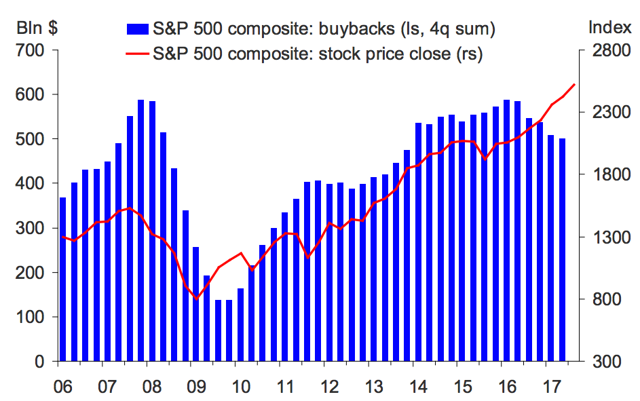 And apparently they are concentrating on the largest of the large-cap stocks. The own 19 million shares of Apple (as of March 31). That is roughly 3% of the current market. I’m in Switzerland as you read this, so I am personally experiencing the reality of currency strength. Have you ever paid $12 for a Diet Coke? (Seriously!) No wonder the SNB is worried about the valuation of their currency. I will be speaking at a conference in Lugano on Monday. The conference sponsors have asked me to give them three questions to ask the attendees during my speech. One of those questions is, do you think the Swiss National Bank will eventually hold $1 trillion in assets? And do you agree with that policy? I will be asking some of the larger asset managers what they will do and how they will react. Hedging? How do you do that in that environment? Gartman is right: How can the SNB sell? The Swiss franc would levitate almost instantly, which is the one thing they are desperate to avoid. As long as people keep trying to convert their money into Swiss francs (at -0.75 basis points! ), the natural direction for the franc will be up unless the SNB continues to intervene in foreign markets. My bet is that they will do so – and that this will not end well. 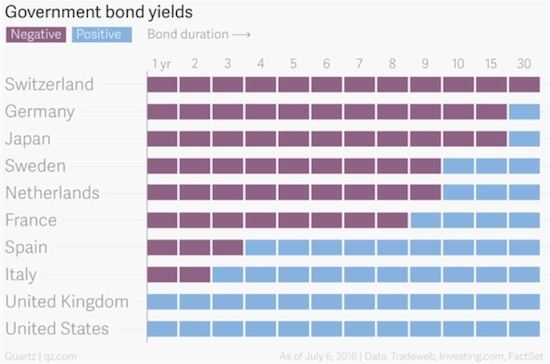 Or maybe they’ll get lucky and their even more massive bond portfolio will offset their losses. 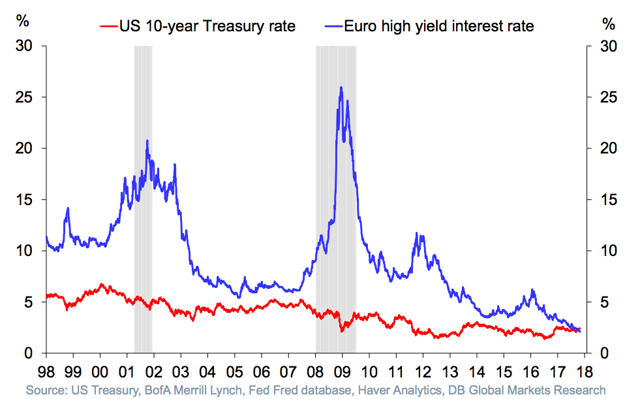 Interest rates are supposed to reflect risk. 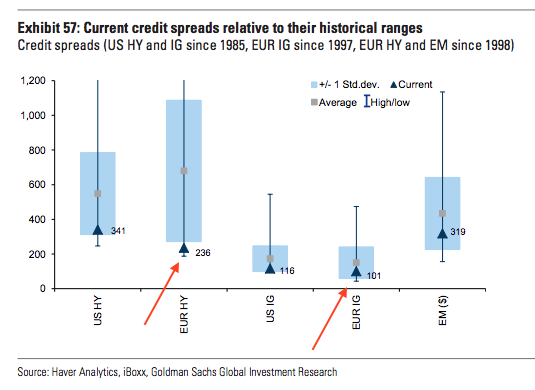 The greater the risk of default, the higher the rate, right? Yet here we see that European small-cap businesses are borrowing more cheaply than the world’s foremost nuclear-armed government can. That, my friends, is absurd. 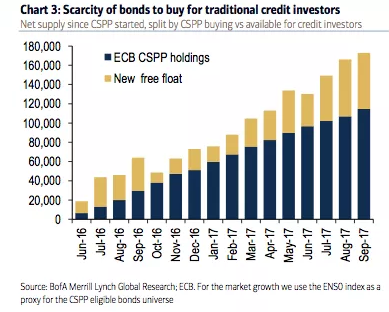 Understand, the ECB is buying almost every major bond it can justify under its rules, which leaves “smaller” investors fewer choices, so they move to high-yield (junk), driving yields down. Ugh. 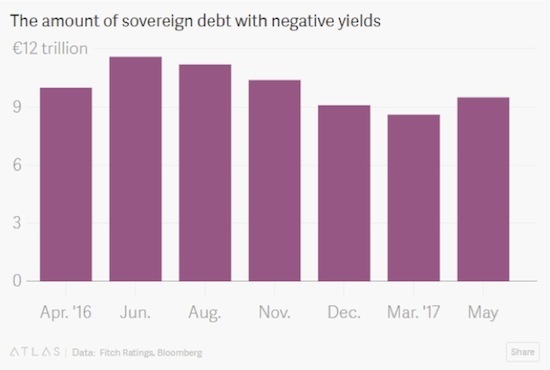 And can anything be more absurd than negative interest rates in long-term bonds? All that said, the economists who designed these interventions had their reasons. They thought lower interest rates and liquidity injections would create jobs, spur investment, and eventually produce inflation. 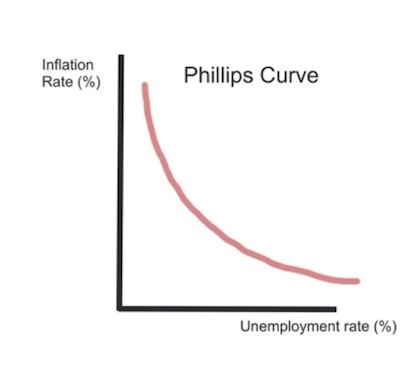 The idea was to then reduce the stimulus before inflation got out of control. Their gauge for assessing this tricky process is the unemployment rate. 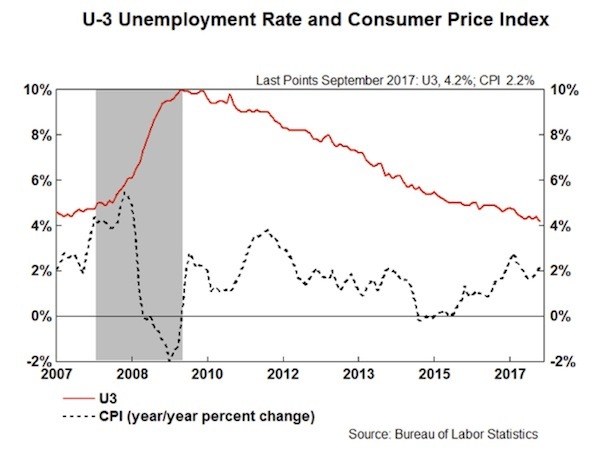 An economy at “full employment” is one in which inflation is right around the corner. The theoretical relationship looks something like this – chart from Gary Shilling. The result is a strange economy in which the people who want jobs mostly have them – but remain deeply dissatisfied, stressed, overleveraged, and often angry. 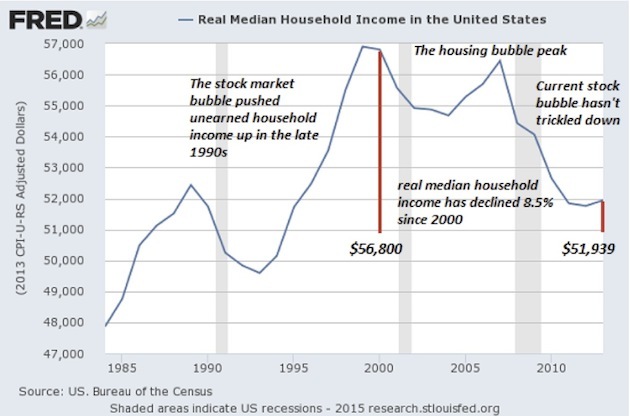 Consider this graph of real median household income, from my friend Murat Koprulu. This is median, not average, household income. That means half of households are doing better and half worse. It’s also inflation-adjusted, so the amounts are consistent over time. We see that the median family is roughly back where it was 20 years ago, in the mid-1990s. Worse, it’s still far below where it was ten years ago before the financial crisis. Is it any wonder people are mad? One more absurdity. In the US we often think education is the key to getting ahead. That’s not necessarily the case anymore. Here’s another chart Murat sent me, showing real average hourly wages by education level. From 2007–2014, possessing an advanced degree enabled you to “get ahead” only in a relative sense. 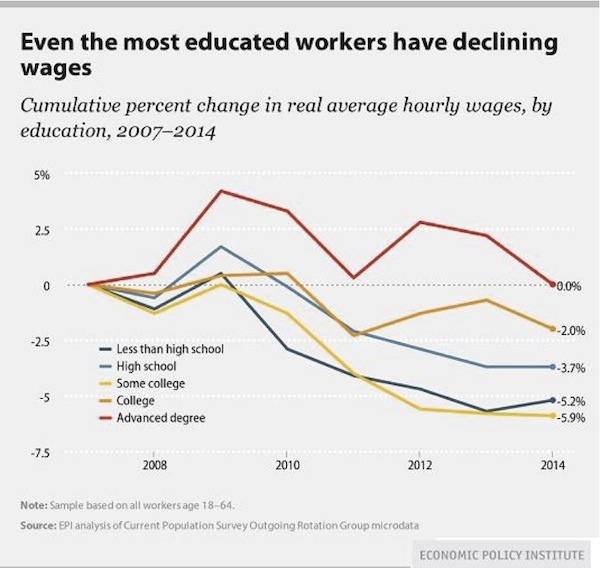 Your wages stayed flat while those of the less-educated fell. Notice how having “some college” was actually more negative for wages than having only a high school education. How can that be? Possibly because going to college without obtaining a degree leaves you in debt with less practical experience than your peers who went straight to work after high school. To that point, student debt is quickly becoming a problem for everyone. 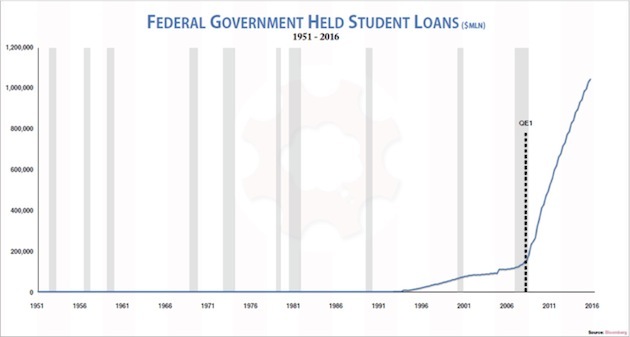 Look at this chart from Grant Williams on student loan debt held by the federal government. Do we add that to our national debt? Taxpayers are on the hook for over a trillion dollars in student debt. Unlike mortgage or business debt, student debt is backed by no tangible asset you can repossess. It bought knowledge that now hopefully resides in the student’s brain, but it may have just gone in one ear and out the other. That makes this debt uniquely risky. You and I are taking that risk, like it or not. And here’s another chart from Grant Williams, showing stock market capitalization to GDP. We are only another healthy bull market run away from being back to dot-com bubble levels. A run that many of my friends firmly believe awaits us. 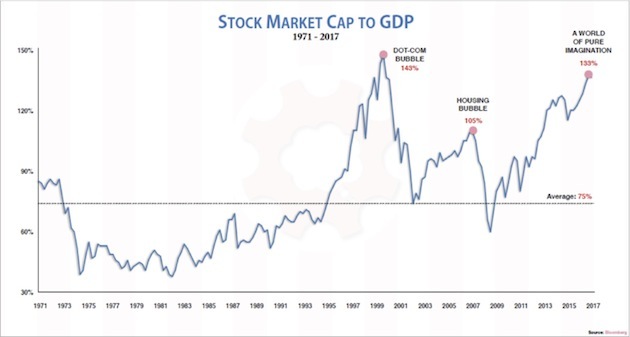 The US stock market as a percentage of GDP is now far bigger than it was at the housing bubble’s peak, and it’s rapidly approaching the dot-com bubble peak. That ought to make us a little nervous as we watch the Dow hit new all-time highs. Usually currency pegs are not a bad place to start when looking for absurdities. And once the Lebanese peg goes, will it be like Thailand in 1997 with Bahrein, Qatar, Oman, Egypt, Pakistan and ultimately Saudi all following suit? And this at a time when 95 cents out of every dollar collected by the US government goes to either pay a) interest, b) entitlement spending and c) defense. Which do you think goes first? So why pay 7x book for defense stock? Okay, John back. Please note the serious level of sarcasm in the right-hand column above: “Good thing there is no common thread in the above names...” It’s all tech and all digital in the top seven. Note, however, that Exxon Mobil keeps hanging in there. The above is why I love Louis and read his analysis every time I get a chance. It’s also one of the reasons that he’s a perennial keynote speaker at my conference. Not only is he a crowd favorite, he comes up with truly investable ideas that the people in the room haven’t necessarily heard of. And so – one last blatant bit of promotion – you really do want to figure out how to get to San Diego for the Strategic Investment Conference. Don’t procrastinate. As you read this letter, I am hopefully already in Lugano, Switzerland and meeting with my friend and business associate Tony Courtney at the Hotel Villa Castagnola late in the evening. I will spend the next two days in meetings and exploring the area before the conference on Monday and Tuesday. If you’re in the area, it’s the Lantern Fund Forum. I have never been to the Italian region of Switzerland and am really looking forward to it. I’ve actually been to half a dozen other areas in the French- and German-speaking parts of Switzerland, but this will be my first visit to Lugano. I guess I should know my geography better, but I was surprised that the best way to get to Lugano was to fly into the Milan airport and take a short car ride across the border. Lugano is in the Lake Como area, and I have always wanted to get there, as so many people have told me that it’s one of the most beautiful parts of the world. This trip also affords me the opportunity to break out my winter clothes, as it gets nippy there at night – something we haven’t experienced in Texas for quite some time. Shane and I will be in Hong Kong for the Bank of America Merrill Lynch conference in early January. That trip will be made even more fun because Lacy Hunt and his wife JK will be there with us. We are going to take an extra day or two and be tourists. I’ve been to Hong Kong many times but have never really gotten out of the business district. Well, Louis Gave did pick me up in his old-fashioned Chinese Junk and took me around to the other side of the island to the yacht club, where we had dinner. The water got a little choppy and I got a little seasick, so I was grateful for the car ride back. But it was really quite a beautiful outing. I very much like Hong Kong. It’s time to hit the send button, as there are a lot of last-minute things to do before we board the plane for Europe, and I absolutely have to get into the gym for a bit. You have a great week! And I hope you have a fabulous Thanksgiving planned. I know we do. IN 1962 a British political scientist, Bernard Crick, published “In Defence of Politics”. He argued that the art of political horse-trading, far from being shabby, lets people of different beliefs live together in a peaceful, thriving society. In a liberal democracy, nobody gets exactly what he wants, but everyone broadly has the freedom to lead the life he chooses. However, without decent information, civility and conciliation, societies resolve their differences by resorting to coercion. How Crick would have been dismayed by the falsehood and partisanship on display in this week’s Senate committee hearings in Washington. Not long ago social media held out the promise of a more enlightened politics, as accurate information and effortless communication helped good people drive out corruption, bigotry and lies. Yet Facebook acknowledged that before and after last year’s American election, between January 2015 and August this year, 146m users may have seen Russian misinformation on its platform. Google’s YouTube admitted to 1,108 Russian-linked videos and Twitter to 36,746 accounts. Far from bringing enlightenment, social media have been spreading poison. Russia’s trouble-making is only the start. From South Africa to Spain, politics is getting uglier. Part of the reason is that, by spreading untruth and outrage, corroding voters’ judgment and aggravating partisanship, social media erode the conditions for the horse-trading that Crick thought fosters liberty. A shorter attention spa...oh, look at that! They make their money by putting photos, personal posts, news stories and ads in front of you. Because they can measure how you react, they know just how to get under your skin. They collect data about you in order to have algorithms to determine what will catch your eye, in an “attention economy” that keeps users scrolling, clicking and sharing—again and again and again. Anyone setting out to shape opinion can produce dozens of ads, analyse them and see which is hardest to resist. The result is compelling: one study found that users in rich countries touch their phones 2,600 times a day. It would be wonderful if such a system helped wisdom and truth rise to the surface. But, whatever Keats said, truth is not beauty so much as it is hard work—especially when you disagree with it. Everyone who has scrolled through Facebook knows how, instead of imparting wisdom, the system dishes out compulsive stuff that tends to reinforce people’s biases. This aggravates the politics of contempt that took hold, in the United States at least, in the 1990s. Because different sides see different facts, they share no empirical basis for reaching a compromise. Because each side hears time and again that the other lot are good for nothing but lying, bad faith and slander, the system has even less room for empathy. Because people are sucked into a maelstrom of pettiness, scandal and outrage, they lose sight of what matters for the society they share. This tends to discredit the compromises and subtleties of liberal democracy, and to boost the politicians who feed off conspiracy and nativism. Consider the probes into Russia’s election hack by Congress and the special prosecutor, Robert Mueller, who has just issued his first indictments. After Russia attacked America, Americans ended up attacking each other. aggravate Washington gridlock. In Hungary and Poland, without such constraints, they help sustain an illiberal, winner-takes-all style of democracy. In Myanmar, where Facebook is the main source of news for many, it has deepened the hatred of the Rohingya, victims of ethnic cleansing. What is to be done? People will adapt, as they always do. A survey this week found that only 37% of Americans trust what they get from social media, half the share that trust printed newspapers and magazines. Yet in the time it takes to adapt, bad governments with bad politics could do a lot of harm. Society has created devices, such as libel, and ownership laws, to rein in old media. Some are calling for social-media companies, like publishers, to be similarly accountable for what appears on their platforms; to be more transparent; and to be treated as monopolies that need breaking up. All these ideas have merit, but they come with trade-offs. When Facebook farms out items to independent outfits for fact-checking, the evidence that it moderates behaviour is mixed. Moreover, politics is not like other kinds of speech; it is dangerous to ask a handful of big firms to deem what is healthy for society. Congress wants transparency about who pays for political ads, but a lot of malign influence comes through people carelessly sharing barely credible news posts. 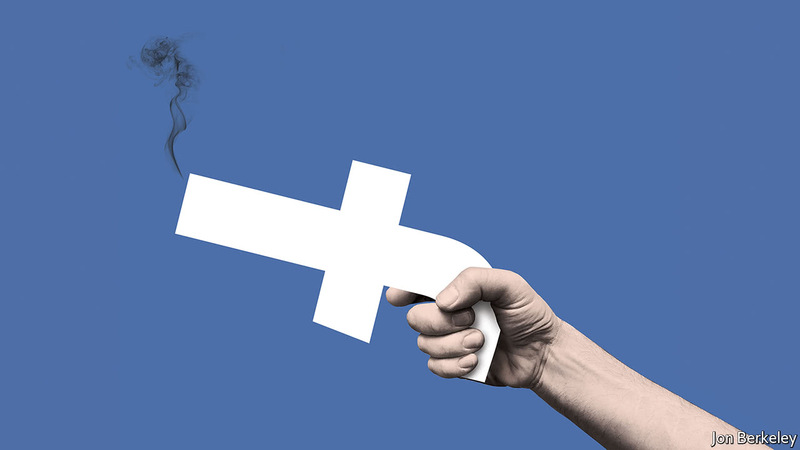 Breaking up social-media giants might make sense in antitrust terms, but it would not help with political speech—indeed, by multiplying the number of platforms, it could make the industry harder to manage. There are other remedies. The social-media companies should adjust their sites to make clearer if a post comes from a friend or a trusted source. They could accompany the sharing of posts with reminders of the harm from misinformation. Bots are often used to amplify political messages. Twitter could disallow the worst—or mark them as such. Most powerfully, they could adapt their algorithms to put clickbait lower down the feed. Because these changes cut against a business-model designed to monopolise attention, they may well have to be imposed by law or by a regulator. Social media are being abused. But, with a will, society can harness them and revive that early dream of enlightenment. The stakes for liberal democracy could hardly be higher. - You want an ironclad bullish thesis for stocks? - Well, look no further than my articles on this platform and elsewhere. - Let me recap this for you using a series of colorful charts and a double-dose of Heisenberg "charm". Every week, on Friday evening, I revisit the recent articles I've posted on this platform and scroll through the comments. Generally speaking, I try to check them over the weekend as well. During the week, I have a hard time keeping up with them. Heisenberg Report consumes the vast majority of my time, and the comments over there are multiplying as is my presence across platforms. That's all fine and good and I guess it's an example of "be careful what you wish for" because frankly, it's exhausting on weeks like this one where there's a lot going on both in markets and on the political front. One of the things I'm not particularly enamored with when it comes to comments on this platform is the extent to which a non-negligible percentage of them seem to suggest a lot of folks aren't actually reading the articles. That's discouraging. And not so much because it invariably leads to comments that don't contribute to the discussion, but rather because I write this stuff because I want people to read it. Now you'd think that would be common sense - writing and reading are two things that work well together like peanut butter and jelly. But apparently, some people are convinced that I have some ulterior motives. I could understand that contention if I were say, writing about individual stocks or if my articles weren't the very definition of thorough. But if you've read more than a half-dozen or so Heisenberg articles either here or on DealBreaker or on my own site, then it's probably occurred to you that there is no conspiracy here. The idea that someone would spend as much time as I do writing entertaining posts that include everything from deep-dives into complex derivatives to pop culture references to tales of nights spent conversing in broken-Albanian at sake bars if the overarching goal wasn't to engage readers is laughable. Plus, you have to understand that there are only a handful of people on planet Earth that are capable of moving markets with macro analysis and Heisenberg is most assuredly not one of those people. Of course, allegations of ulterior motives aren't the only thing that gets lobbed at me by readers. There's another crowd who likes to contend that based on my disclosures at the end of the articles and based on the sheer volume of content I produce across websites, there's no way I could actually be trading. A couple of things there. First, with the possible exception of placing a bet and losing everything immediately, there is no better way to evaluate a trade than writing about the thesis behind it and thereby implicitly soliciting feedback from millions of people on the internet. Just ask my buddy Kevin Muir, who does that all the time. Kevin shares his trades. The fact that I don't is my prerogative as long as I don't lie in my article disclosures, something I have never done and something I never will do. But you want to be careful about reading voluminous analysis that sounds some semblance of sophisticated and then somehow coming to the conclusion that a person who posses that level of acumen isn't actively using it. Second, it is my long-held contention that no one should be implicitly or explicitly telling other people how to allocate their money without having an intimate understanding of other people's financial situation. That's my opinion. Other people have a different opinion, and indeed, I understand that "actionable" articles are part of what makes this site unique. But just because someone doesn't explicitly tell you what to buy/sell and when to do it, doesn't mean the information provided isn't actionable. I provide a veritable treasure trove of macro analysis that, to someone who knows how to use it, is the very definition of actionable. And that brings me very neatly to the title of this post - "Heisenberg The Uber-Bull." It is absolutely critical that you understand the extent to which dumping $14 trillion in liquidity at the top of the quality ladder (as central banks have done since 2009) drives people down that quality ladder and out the risk curve. That isn't a "theory", and if it was a theory prior to 2009, it has certainly moved into the realm of "fact" since. You don't just drive rates on risk-free assets to zero and below without pushing people into riskier assets like stocks (SPY). Relatedly, the only way creating a scarcity of available assets doesn't drive up the price on those same assets is if there's a concurrent drop in demand. Absent an offsetting drop in demand, shrinking the size of the asset pool drives up asset prices. That's just all there is to it. Now, if what you want to do is go back and try to write your own narrative about what other factors might have served to accelerate the rise in asset prices (and those factors can include anything from earnings/revenue growth to whatever you think you can divine from looking at lines on a chart), well then that's certainly fine. But what you can't do is pretend like reducing the supply of purchasable securities doesn't drive up prices. Given all of that, and given the great lengths I have gone to in an effort to exhaustively detail the extent to which central banks are acting on both the supply and demand side of the equation (on the supply side by purchasing assets and on the demand side by pushing yields lower and thereby sending everyone off on a quest for returns), you could very plausibly say that there is no bigger bull than Heisenberg. Additionally, I have repeatedly outlined how an exit from these policies is made virtually impossible the longer they remain in place. That contention goes back to what Deutsche Bank's Aleksandar Kocic has called "the permanent state of exception." The market is under what amounts to martial law, and the dynamics that creates in terms of embedding feedback loops that optimize around the existing state of affairs means that lifting martial law becomes an increasingly far-fetched proposition as time goes on. Clearly, this cannot go on forever. That's where "Heisenberg the uber-bear" comes in. At a certain point markets will literally break. And indeed, the JGB market is close to reaching that tipping point. But in the interim period, an enterprising person could very well take everything I've said over the past 15 months on this platform and make the most bullish case imaginable. If you wanted to take it up another notch, you could throw in the perpetual motion machine created by ETFs on the way to claiming that selling has now become a logical impossibility - something I only half-jokingly suggested earlier this week. I'm running out of ways to put this in the face of a veritable barrage of claims being made on social media by market pundits with literally millions of followers. 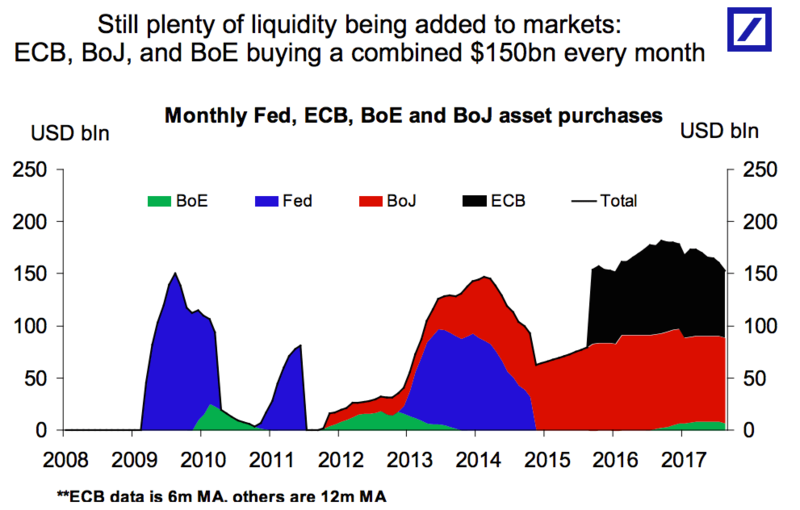 Between the BoE, the BoJ, and the ECB, central banks are still buying $150 billion worth of assets every single month. And here's the thing: these are not estimates derived after the fact. I mean, with the ECB you always have to go back and check on exactly what was bought because the capital key complicates things a bit, but what I'm trying to tell you here is that this buying is preordained. It is policy. It is programmatic. You can read all about it on their official websites. So there is no "end" of QE. 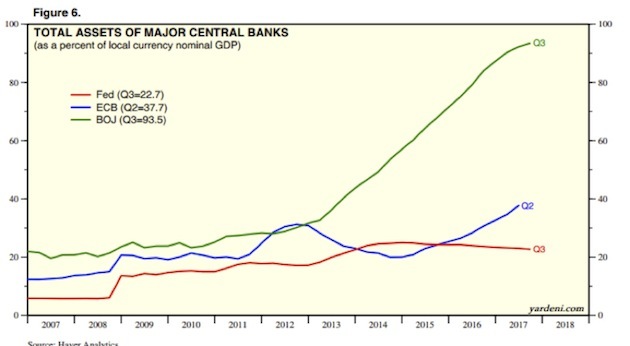 Additionally, what you see in that chart doesn't even include any flows from Norway's $1 trillion SWF, the SNB, or any EM central banks that increase their FX reserves in a given month. If that's not a bullish thesis, well then, I don't know what is. ECB = the steamroll of vol. Additionally, it further reinforces our view that the market will continue to operate in a “buy-the-dip mentality”, especially as there is scope for the CSPP to remain strong well into the tapering phase of 2018. 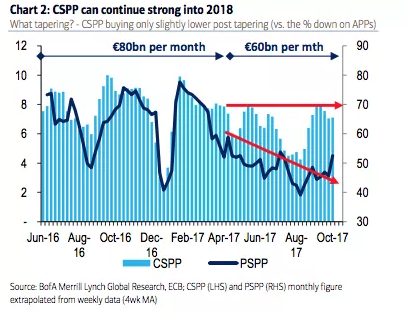 Note that the CSPP buying pace is only slightly lower compared to the pace it started 18 months ago, despite tapering from €80bn to €60bn last April. Scarcity of bonds will remain a key tailwind for spreads and credit vols, on the back of too much money chasing fewer bonds. 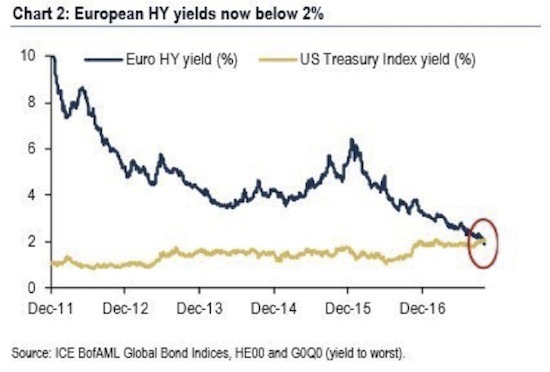 "Oh nothing, just European junk bonds trading inside of US Treasurys." So you kind of have to connect the dots here. What do you imagine happens when you get those sort of distorted dynamics in one market? Well, naturally investors simply go to other markets. Ok, so guess what happens next? What happens next is that all of that demand drives down yields in the new locale. Of course, that demand is also met with supply, and guess where the proceeds from that supply end up? Surprise! It's all one trade folks. It's all one giant global QE trade. And see this gets back to what a lot of people still don't understand. I don't present this kind of analysis in an effort to prove that I am "right." When central banks come out and tell you that they are going to do something (in this case, print $14 trillion in money out of thin air and drive investors into riskier assets in an effort to reflate the global economy) and then they go out and do just that, there is no sense in which I am "right" to document it. Rather, this just is what's happening. I am no more "right" to point it out than I would be "right" to point out that the sun rose in the East again today. When something as simple as supply and demand is at play and the people who control the printing presses are distorting the supply/demand balance and telling you they're doing it at every policy meeting they hold, it makes no sense to say that anyone who discusses that is providing "proof." Rather, the burden of "proof" rests on anyone who claims that somehow what's going on isn't responsible for what you see in terms of asset prices. Spoiler alert: trying to provide that "proof" is impossible. There is simply no way that someone who is bullish based on a thesis that differs materially from the dynamics laid out above has any hope of making a plausible argument to support the contention that there is a factor or even a set of factors with more explanatory power than the deliberate distortion of supply and demand by people armed with printing presses. That's not to say that one cannot come up with a long list of contributing factors that may play a role in supercharging what would be going on any way, and indeed, I myself have added several things to that list, including the effect of passive investing. But if what you are looking for is an ironclad, bullish thesis, it is literally impossible to find a better one than that which I have laid out on innumerable occasions in these pages and elsewhere and which I have just documented again for you above. While serving as CEO of PepsiCo, John Sculley was recruited by Steve Jobs to become CEO of Apple in 1983. After a disagreement with Jobs over business strategy in which the Apple board sided with Sculley, Jobs left the company and Sculley continued at the helm of Apple until 1993. Since then, Sculley has co-founded or invested in technology-focused companies in many industries, including media marketing, financial services and health care. Knowledge@Wharton recently spoke with Sculley about working with Steve Jobs and his views on the emerging fields of artificial intelligence, cloud computing, data analytics, health care innovation and the industrial internet. Knowledge@Wharton: What is the biggest misconception people have about Steve Jobs? John Sculley: There is Steve Jobs 1.0 and there is Steve Jobs 2.0. Most people know Steve Jobs 2.0, who was probably the most successful CEO ever. He was brilliant and created products that achieved his long term personal goal — which is to put a dent in the universe. When I met Steve Jobs 1.0, he was 26 years old, turning 27, and was just as brilliant, just as creative, just as visionary. But it was a different time. We were still in the early days of the implications of Moore’s Law. Computers couldn’t do a lot of the things that Steve envisioned. Steve recruited me to Apple because he was fascinated by how Pepsi had gone from being outsold 10-to-1 in about 50% of the U.S. to, by the end of the Cola Wars, passing Coca-Cola, the largest consumer packaged goods company in America. He asked, “How did you do it?” I said, “Steve, Coke owns reality.” They were the most valuable brand in the world at that time. We realized that we couldn’t compete on their ground rules. We [recognized that] perception leads reality. Silicon Valley back in the early 1980’s was mostly engineers trying to build increasingly powerful computers. It was all about memory and storage and processor power. Steve Jobs said, “It’s not about technology for the engineering and business professionals. I want to build a personal computer for non-technical people so that they can do amazing, creative things.” He called it a bicycle for the mind. Most people still think of Steve Jobs as a technical wizard. He wasn’t an engineer. He was more interested in design and in building products that had no compromises. Steve had an insatiable curiosity about what might be possible with consumer marketing to help him achieve his vision of this bicycle for the mind for non-technical people to do amazing, creative things. I joined Apple. We worked on perfecting some of the ideas we started at Pepsi in what is known today as experience marketing. Probably the first example is the now famous ‘1984’ Super Bowl commercial. People were just amazed by it. We only spent a million dollars on the media for it, but it got played over and over by the television networks. We calculated it was [equivalent to] about a $45 million spend. Knowledge@Wharton: Steve Jobs 1.0 is famous for being brilliant, but also somewhat volatile. How did you manage that relationship? What advice do you have for others who may have employees that are brilliant, but difficult? Sculley: I would advise the boards of entrepreneurial companies that the role of the founder is the most important decision a board can make — how do you treat a brilliant founder and reinforce him to be successful? In hindsight, I didn’t appreciate the founder’s role. I had come out of East Coast corporate America. The Apple board could have played a role to say, “There’s got to be a way that Steve and John can work together.” I wasn’t hung up on titles. In hindsight it probably would have been better to make Steve the CEO, and I could have been the COO and chairman. For three years, Steve Jobs and I were probably as close as any two people Steve had in his life at that time. It wasn’t that we didn’t like or respect each other. When I first came in, the highest priority the board asked me to work on was to turn the Apple II sales around. The Apple III had failed before I got there. The Apple Lisa had failed. The Apple II was going to be the only source of positive cash flow for Apple for probably three years. I was focused on turning around the Apple II, which succeeded. Steve was focused on creating the Macintosh. When the Macintosh got introduced into the market, the Apple II was still the only source of cash flow. If we had cut the advertising back on Apple II and lowered the price of Mac, it would have had dire consequences for the company. That was the basis of the break up between Steve Jobs and me. Looking back, if I had understood how important a founder’s role is on things like vision, and the brilliance which Steve had from a product standpoint, we probably could have figured out … roles for both Steve and me that would have worked. But you can’t look back and change the past. Knowledge@Wharton: What is your view of Apple now? What advice would you give to Tim Cook? Sculley: I think Apple is being brilliantly run by Tim Cook. They’ve increased their market cap by $246 billion in a year, they’re still the most valuable company in the world, and they still have the most admired products in the world. You have to give Tim a great deal of credit. The challenges going forward are that so much of the innovation on new things — like artificial intelligence and driverless cars — is happening in other companies. The question is, how does Apple want to handle that situation? Maybe Apple says that they are so successful in what they are doing and there is so much growth ahead, they can stay the course. Or maybe they’ll choose to take some of that huge cash they have on the balance sheet and start to look at other things. I don’t know what their choices will be, but I’m very complimentary to what Tim Cook has accomplished. Knowledge@Wharton: You’ve talked in the past about “moonshot projects.” With all of Apple’s cash, might that be the kind of initiative they should be investing in? Sculley: I have no idea. I haven’t been at Apple for two decades, so I don’t have any insight as to what Apple might be considering. What I do know is that this is probably the most interesting time to be doing truly disruptive innovation, moonshot-type projects. When I was in Silicon Valley there was one exponential growth technology: Moore’s Law. About every 18 to 24 months the number of transistors you could put on a given area on a silicon wafer would double. That has gone on consistently now for decades, and we’re able to do things that were not even imaginable back in the 1980s. Now we have exponential growth not only of Moore’s Law, but of storage, of cloud computing, of big data analytics, which has huge implications for new fields like artificial intelligence, precision medicine and driverless cars. There has never been a more interesting time to be in entrepreneurial capitalism than right now. Knowledge@Wharton: Let’s talk about some of your other companies. About a decade ago you co-founded Zeta Global. The company’s website describes it as a company at “the intersection of people-based data, artificial intelligence, and omnichannel campaign management.” Can you clarify what that means? Sculley: Think of it this way: Marketing [now] is dramatically different from the marketing I practiced when I was at Pepsi or even when I was at Apple. Today, we’re able to do very personalized messages. Every message that goes to every potential customer can be crafted with the knowledge of a lot of the behavior of that individual, the interests of that individual, and the ability to watch how they react to different messages. That’s what Zeta Global does. Zeta Global is not in the creative side of marketing. I think we’re now the largest independent marketing cloud company in the world. We have about 1,400 employees, and we have acquired a number of companies. The most recent was an artificial intelligence company called Boomtrain. We have a large number of the Fortune 500 companies working with us on a whole range of verticals. We do what’s called lifecycle marketing, where we identify customers that can be acquired, we manage the engagement, we do retention marketing, we manage loyalty programs, and we can monetize customers over a long period of the consumer life cycle. Knowledge@Wharton: You’ve mentioned artificial intelligence a couple of times. It’s a term we hear a lot about these days, but it’s used to cover a broad range of applications — from human-level intelligence to merely clever computer algorithms. What are the practical business applications of artificial intelligence? Sculley: I had my first introduction into Bayesian statistics when I was at Wharton. I worked at the Management Science Institute founded by professor Wroe Alderson and professor Russ Ackoff. We were doing Bayesian statistical modeling. It was just probability theory, which is at the basis of machine learning. After I graduated from Wharton, I went to the Interpublic Group of Companies, doing market research with what was called Markov Chain Analysis and Monte Carlo Game Theory. Back in those days, the 1960s, these mathematical algorithms were more of a curiosity than something that was terribly useful, because we didn’t have massive data, we didn’t have massively powerful computers. But everything we’re doing today in machine learning — machine learning being the first step in artificial intelligence — goes back to probability math, the stuff I have been involved with all through my business career. I’ve been very interested in where artificial intelligence is going. The kinds of things we do at Zeta Global or at another company I’m working on in the fintech space, Lantern Credit, where we have a technology called Beam AI, goes beyond machine learning. We’re using deep learning, which is when you are looking at more layers of data and are trying to determine patterns out of chaos. At Lantern Credit, we’re taking the whole world of consumer credit scoring and applying deep learning, so we can be much more accurate and can give a clear audit trail, which is important to regulators. Most people of the tech world believe that AI is the new OS. The operating system, the OS, is a fundamental foundational element to everything we do in the high-tech industry. AI is going to be a foundational technology of everything that will happen, not just in high tech, but in the way that high tech is an enabler in changing many industries around the world. AI probably has as long a run ahead of it as Moore’s Law has had over the past 46 years. Knowledge@Wharton: You’ve mentioned some of the ad campaigns you’ve worked on. A lot of advertising, particularly online advertising, is hitting a crisis point. People are blocking ads because they’re so intrusive. Ads respond by getting more aggressive. Is there a way out of this cycle? Sculley: I think there is a way out. It helps to be a good observer of what smart people are doing. One of the smartest companies out there, which will not be a surprise to anyone, is Amazon. Jeff Bezos doesn’t start with the technology, he starts with the customer. He says, “What’s in it for the customer?” To unwrap of all of the issues in marketing that make it so oversaturated, Amazon created Amazon Prime. They have 80 million members who get special rewards, incentives and all kinds of services, and they build loyalty. Bezos has figured out how to look at the entire experience that a consumer has with a product or a service. Back when I was in consumer big brand marketing, we didn’t have the tools to deal with that, nor, quite frankly, were we even thinking about it. We built big mega brands with massive advertising. We couldn’t differentiate between the individual interests of people. We were doing big image campaigns using mass media — television and print — with large audiences. We have never seen so much concentrated power in the hands of so few media marketing companies as we have today. If you look at Facebook and Google, and you can probably add Amazon to that list as well, there is an incredible amount of power that these companies have. How are they thinking about that power? How are they adapting to both the reality of their success and the reality of the criticisms they have, being in the spotlight? Fortunately, there are some really smart people running these companies, and they are each learning from each other. We are all working in an exponential time. Back in my era, most of the world was working in linear time. In 2007, when Steve Jobs was putting a phone chip in the iPod and launching the first iPhone, Eastman Kodak had just doubled down on their investment in vertical integration to compete with Walmart’s single-use film camera. Kodak was the company that invented the digital camera; they were the largest photo film printer in the world. Here was a $26 billion [company], and then four years later Kodak filed for bankruptcy and Apple ruled the world. In linear time, we’re used to things happening over decades or longer. Kodak knew digital photography was coming. No one was expecting it to happen that quickly. It’s not just Kodak exposed to these types of changes. Walmart had to buy Jet.com to respond to Amazon. General Motors has had to rethink their business and invest $500 million into Lyft. In the first 10 years in his tenure as CEO at GE, Jeff Immelt said he didn’t realize that his whole industry was going to radically change. In the last six years GE has been racing, in exponential time, to completely reinvent their company as a software company on the industrial internet. This is going to go on in industry after industry. It’s what I’m working as chief marketing officer and chairman of RxAdvance, in the health care space. Knowledge@Wharton: Speaking of health care, is the U.S. government helping or hurting business opportunities in that área? Sculley: I think I can say without being arrogant that the government leaders are focused on issues that are not significant to how to build a sustainable health care system in the United States. They are debating the ideology of whether we replace or repair the Affordable Care Act. They are debating whether the states should have more authority or whether the federal government should be given a stronger role in the future of how we deliver health care. None of those issues is going to make health care sustainable. Health care is a more than $3 trillion spend a year. It’s about 17% of the GDP. Health care is incredibly inefficient. McKinsey Global Institute has done studies that show about $900 billion of this $3-plus trillion [market] is a fraudulent, abused, avoidable cost. It’s an industry that has been shaped by special interests more than logic. That’s one of the reasons you haven’t seen the big high-tech companies move into it — you have to have deep domain expertise in all of the complexities that make up our health care system. Our founder and CEO, Ravi Ika, has been in this industry for 16 years and is one of the most successful entrepreneurs building cloud-based platforms. At RxAdvance, we’re focused on what’s called the “avoidable drug-impacted medical cost.” That’s $350 billion every year in the U.S. health care system that could be avoided if you had a way to manage this huge amount of expense, particularly that the chronically ill spend. Five percent of the population spend $1.5 trillion a year — that’s half of the health care spend in the U.S.
What we call the “noble cause” that we’re focused on at RxAdvance is how to bring cloud-based automation into the RX ecosystem anywhere that prescription drugs touch the health industry — from patients all the way through health professionals, physicians and formularies, to the pharmacies and the health plans. How can we take billions of dollars of cost out of the delivery of prescription medications? How can we significantly improve the quality of life, particularly of the most expensive patients, the chronically ill? We started RxAdvance in 2013. We believe we can get to about $10 billion in revenue by 2020. We’re already at break even and growing incredibly fast. It’s a very exciting sector to be involved with. We have a terrific leader and management team, and I love being the chief marketing officer. Knowledge@Wharton: How does moving to a cloud-based architecture lower costs? Can you provide more detail on that aspect? Sculley: Absolutely. Let’s take that 5% of the population [responsible for] roughly half of the health care spend in the U.S. They typically have nine chronic care diseases. The only source of the medications that are being prescribed to these patients comes from what is known as the PBM, the Pharmacy Benefit Management system. RxAdvance is the first Pharmacy Benefit Management system that has been built on cloud computing and uses sophisticated data science to automate the process across the entire continuum of care. It’s a gigantic industry, with hundreds and hundreds of billions of dollars highly concentrated into about four companies. All of the other PBM’s are still running on technology that was designed and built 30 years ago — mainframe computers with green screens and COBOL programming. RxAdvance is built on cloud computing. We can dramatically lower the cost. We can give complete transparency into all of the drug economics. We take no spreads — the controversial moneys that go back and forth between payers and pharmaceutical companies and Pharmacy Benefit Managers like us. We just take a little flat fee on every claims transaction. Patients who have nine chronic care diseases may typically take 15 to 25 pills a day. Somewhere between 30% to 40% of the medications are duplicates of each other because different specialists are writing the prescriptions. They’re perfectly competent, they just don’t have the data on all of the drugs the other specialists are writing. They don’t know which drugs are known to have interactions with each other. With our cloud-based platform, we’re able to track all of that prescription data, personalized down to those individual patients. At the same time, we can go out to their point of care and can track whether they are actually taking the medications or are exercising. We can track all of these vitals electronically and bring it back to our cloud platform, which means we’re able to avoid having chronic care patients, who have been dismissed from the hospital, being readmitted within 30 days after discharge, which typically has penalties of $10,000 to $20,000 a night. The costs that we can take out of the health care system with just that 5% of the population is literally billions of dollars, which is why we’re growing so fast, and are optimistic that we can be one of the role models for how you can disrupt health care. Even if we are wildly successful, we’re still going to be a relatively small business in the context of a $3 trillion health care industry. We think that eventually we can get RxAdvance up to a $40 billion — or $60 billion business by the mid-2020s. Even then, that’s not a significant part of the entire health system. We expect there will be other companies that will see from our experience things they may be able to do. Hopefully there will be a revolution in health care just as we’re now seeing a revolution in precision medicine with the ability, for instance, with CRISPR-Cas9 to edit the human genome, or the work I’m doing with another one of my companies called Cellularity, the largest source of placenta-based stem cells, working on regenerative medicine. There are so many different fields that I was lucky enough to be exposed to over decades in the high-tech industry that are now becoming incredibly practical. What we’re doing with RxAdvance in health care, or Lantern Credit in fintech, or Cellularity with regenerative medicine are examples of the power of data science. Knowledge@Wharton: While this aggregation of data improves efficiency, doesn’t it also raise privacy issues? Sculley: Absolutely. I was around in the early days of the internet. It was originally a way for government labs to be able to communicate with the major technical universities. That evolved into the World Wide Web. Tim Berners-Lee created HTML and HTTP, Hypertext Mark-up Language and Hypertext Transport Protocol, and adapted the internet to the kinds of things that we can do with the World Wide Web. But it is still the same internet that was created for scientists back in the 1970s. There is a lot of serious discussion that maybe we have to build an entirely new internet that has significantly different architecture from a security standpoint. It’s going to be fundamental as we move into cybersecurity for cryptocurrency alternatives to cash. It’s obviously a huge issue as we can see with the Equifax breach that happened this past year. Knowledge@Wharton: Who is the “we” here? The internet was initially built by the government and then later employed by private businesses. How do you see this next generation internet being created? Sculley: It’s certainly beyond anything I have an answer for. The internet was built for a different purpose in the U.S. We then had an independent group called ICANN, which was not [run by] the government, [but] it was concerned technologists [behind it] who said we have to find governing rules for the internet. Today, you have every major country saying, “We don’t like the idea that the U.S. is controlling all of the innovation on the internet.” China has hived off their internet and is running an entirely different internet set of rules. My guess is it’s going to be much more global. When you bring the government in to try and figure these things out, we don’t necessarily get the best technical solutions. We get the most accommodating political decisions. I honestly don’t know who is going to figure all of this out. I suspect that if it’s going to be successful, the private sector is going to have to be at the lead of determining what the internet of 2030 really looks like. But it has to be realistic. We’re in a global economy today. It would be naïve to think that we can make all of those decisions alone in the United States. Knowledge@Wharton: What continues to motivate you? Sculley: I am still insatiably curious. Most people of my generation in high tech are no longer active. I’m still at it. I don’t run companies anymore; I invest in and mentor companies. I love mentoring talented entrepreneurial founders. That’s what motivates me. I work in some incredibly exciting industries that are in the early days of what these industries will look like 20 or 30 years from now. I feel extremely lucky to be able to be involved in as many interesting things as I am currently working on.